The Chicago Folklore Ensemble is having its premier performances this Fall! Save the dates, and come hear the music and stories of Chicago immigrants. October 15, 7:30pm, International House at University of Chicago (1414 E 59th St). October 23, 7:30pm, Musical Offering (743 Custer Ave, Evanston, IL). November 8, 12:00pm, City Winery, (1200 W Randolph St). September 20, 2:00pm, Morton Grove Public Library, (6140 Lincoln Ave, Morton Grove, IL). October 20, 2:00pm, Park Ridge Public Library (20 S Prospect Ave, Park Ridge, IL). From the Serbian mountains of blood and honey to the passionate coasts of Argentina, rattling buses tearing through Thai countryside and back to sweet home Chicago, we’ll take you on a journey around the world atop a carpet of music and story. 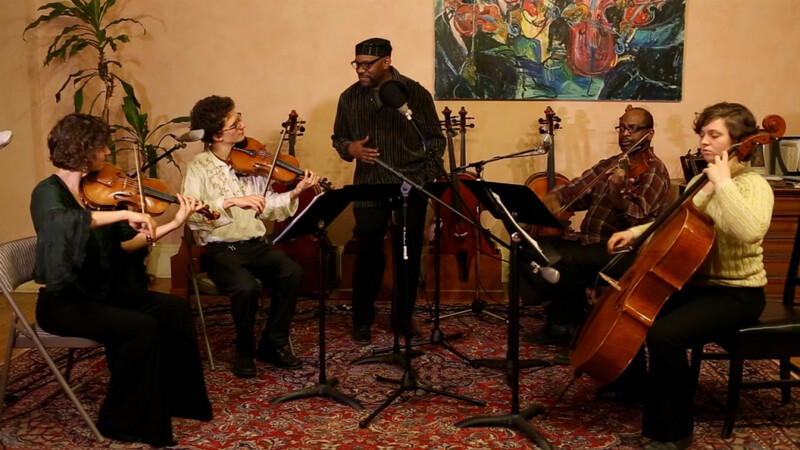 String quartet and storyteller come together to narrate the sounds, tastes, emotions stored in the memories of Chicago immigrant musicians.